Having a dog is one of life's truest pleasures, and taking your dog for a walk is just one joy of canine ownership. However, a lot of dogs don't like the lack of freedom to run anywhere they want to go. They want to explore and sniff everything in sight, and this isn't possible while walking on sidewalks or side streets. They often pull on the leash, choking or gagging, and sometimes they refuse to move at all and just lay down. They might have mobility issues or need a more visible aid. The Kurgo dog harness helps when dealing with any of these issues. 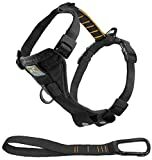 What Is the Kurgo Dog Harness? Owners often get so frustrated with the trouble that normal leash walking causes that they don't walk their dogs at all. We all know that dogs need their exercise, not only for health reasons but because they can become overactive and destructive without regular exercise. The Kurgo dog harness gives your dog the exercise that will tire him/her out; possibly eliminating these problems. The added benefit to your own health is just a terrific bonus. Dog owners want to know that their fur babies are safe. When dogs are allowed freedom of movement, there are many situations that can cause harm to them. These include danger from roads and vehicles, getting lost, being stolen or put into shelters. These situations can occur no matter where we live, be it in rural or urban areas. Dogs are a part of our families and we just want what is best for them. The Kurgo dog harness is a product that will keep your dog healthy, safe and happy while giving owners peace of mind. The Kurgo dog harness is an everyday harness that can be used for walking, running, and/or hiking. It easily slips over your dog's head and then clips around the midsection of your pooch. The Kurgo dog harness has 5 adjustable points that provide a customized fit for all shapes and sizes. You can also use this harness when traveling in your car since it comes with a 10-inch lead that can be used as a seatbelt. The Kurgo dog harness features a halt D-ring on the chest area which eliminates the pulling and choking that happens with regular collars. If your dog tries to pull on the front leash attachment, it just turns them around; which is great for training purposes. The chest plate on the Kurgo dog harness is padded, providing extra comfort to your dog. This results in less stress on the trachea and sternum by dispersing kinetic energy across the dog's chest. The Kurgo dog harness also features quick release buckles around the midsection making it easier to put on or take off. The Kurgo dog harness comes in several different sizes, including extra small for dogs weighing 5-10lbs, small for dogs weighing 0-25lbs, medium for dogs weighing 25-50lbs, large for dogs weighing 50-80lbs, and extra large for dogs weighing 80+ lbs. The extra-small harness fits dogs with neck sizes of 9-13 inches and a chest size of 12-18 inches. The small harness fits dogs with neck sizes of 12-20 inches and a chest size of 16-22 inches. The medium sized harness fits dogs with neck sizes of 16-25 inches and a chest size of 18-28 inches. The large sized harness fits dogs with neck sizes of 18-30 inches and a chest size of 24-34 inches. The extra large sized harness fits dogs with neck sizes of 24-35 inches and a chest size of 28-44 inches. The Kurgo dog harness is available for an estimated cost of $$ and can be found at Petco, Petsmart, Amazon, Ebay, and other retailers. The Kurgo dog harness is easy to use because it just slips over your dog's head and buckles into place using the quick release buckles located around the midsection. There are different points of adjustment making it a secure fit regardless of your dog's size. The Kurgo dog harness has a terrific design. There are several points of adjustment that allow for a truly secure fit no matter the size of your dog. The Kurgo dog harness also comes with a padded chest plate designed for ultimate comfort. This padded chest area results in less stress on the trachea and sternum. The harness also comes with a 10-inch lead that can be used as a seatbelt tether for traveling. The Kurgo dog harness has a lifetime warranty on craftsmanship not including normal wear and tear. They offer a repair and replacement service for a nominal fee. The EXPAWLORER Big Dog Soft Reflective No Pull Harness is recommended for larger dog breeds; however the chest plate is adjustable to fit dogs of other sizes. This harness fits those canines that have a chest size of 26-36 inches and is designed with a sturdy metal D-ring. The EXPAWLORER Big Dog Soft Reflective No Pull Harness has reflective material that keeps your dog visible during evening walks. There is also an additional rubberized handle fastened to the harness that allows you to control your pet more easily. The handle position is above the D-ring attachment and is built with durable nylon material. The harness is made with breathable fabric providing more comfort for your pooch and is designed to prevent unnecessary traction while the neoprene lining promotes comfort. The EXPAWLORER Big Soft Reflective No Pull Harness is easy to use and well constructed. As with other harnesses, you simply slide it on and fasten the buckles. The EXPAWLORER Big Soft Reflective No Pull Harness is designed for your dog's comfort in mind. It is recommended for larger breeds and has a sturdy metal D-ring attachment. The material is reflective allowing for higher visibility at night. The EXPAWLORER Big Soft Reflective No Pull Harness has an additional rubberized handle that fastens to the D-ring making control easier. The EXPAWLORER dog harness comes with a lifetime warranty. The 2 Hounds Design Freedom No-pull Dog Harness features a control loop on the back of the harness which tightens around your dog's chest. The harness is made with 4 adjustment points and stainless steel hardware to manage dogs anywhere from 14 lbs up to 250 lbs. The 2 Hounds Design Freedom No-Pull Dog Harness has a chest strap that is lined with Swiss Velvet helping to prevent chaffing and rubbing that can cause sores on your dog's skin. The 2 Hounds Design Freedom No-Pull Dog Harness comes with an optional training leash that allows the owner to connect to both the front and back rings simultaneously. The training leash is three feet when attached to both rings and five feet when attached to just the one ring. The 2 Hounds Design Freedom No-pull Dog Harness is easy to use, is multi-functional, and comes with a double-ended leash. It discourages pulling when the leash is attached to the front. When the leash is attached to the back, it's great for exercise. The 2 Hounds Design Freedom No-pull Dog Harnesses design is well made and lowers or eliminates pulling, neck strain, and the possibility of escape. The 2 Hounds Design Freedom No-Pull Dog Harness is designed to keep your dog's spinal cord in alignment and is the best in flexibility, control, and for training purposes. The 2 Hounds Design Freedom No-Pull Dog Harness has velvet lining on the strap that is behind your dog's legs, preventing the chaffing and sores seen with other harnesses. The webbing edges are turned out to keep them from irritating your dog's skin. The 2 Hounds Design Freedom No-pull Dog Harness offers a lifetime chew repair warranty. This means that they will replace up to two straps of the harness for $7.00 to cover the return shipping. There is an additional charge of $2.00 per strap if more than two are chewed. There is also a $2.00 charge per buckle or hardware if that needs replacing. The PetSafe Easy Walk Harness has adjustable straps to help distribute pressure evenly across your dog’s chest and belly. These harnesses are great for brachycephalic (flat-faced) breeds like Pugs that need harnesses to protect their necks from pressure. The PetSafe Easy Walk Harness discourages your dog from pulling while on the leash. The front-chest leash attachment steers your dog to the side, redirecting his attention back to you. The chest strap minimizes pressure on the throat area so there's no gagging. The PetSafe Easy Walk Harness is easy to use. The harness stops your dog from pulling with a comfortable front leash design with loops that redirects forward motion. The PetSafe Easy Walk Harness has four adjustment points, giving it a reliable fit. The harness has a loop in the chest piece that prevents twisting and it has snap buckles on the shoulder and belly straps to make it easy when putting it on and taking it off. The collar sits high on the dog’s neck so there is no pressure on the throat area. The PetSafe Easy Walk Harness comes with a limited one-year warranty on material and workmanship. In conclusion, dog harnesses are available in a wide range of styles and sizes. The Kurgo dog harness fits dogs ranging from extra small to extra large and comes with a lifetime warranty. The harness also features quick-release buckles and a very comfortable design including a padded chest area. The Kurgo dog harness is great for everyday use. Whether you are walking, running, or hiking just slip the Kurgo dog harness over your dog's head, clip the buckles around the midsection and you're off. The Kurgo dog harness features a D-ring on the chest area that eliminates the choking and pulling often experienced with regular collars. When your dog tries to pull on the leash attachment, they will get turned around, thus helping with training. Based on your dog's age and level of leash experience, owner's have two leash attachment options. The chest pad provides ultimate comfort by reducing stress on the trachea and sternum while dispersing kinetic energy across your dog's chest. If you happen to travel, the Kurgo dog harness is designed with safety in mind. The harness comes with a 10-inch lead that can be used as a seatbelt and is crash-rated for dogs that weigh up to 75 lbs. The Kurgo dog harness provides five adjustment points for an almost customizable fit. The Kurgo dog harness is machine washable, however, we recommend line drying as it may shrink if put into the dryer. We highly recommend the Kurgo dog harness and give it five out of five stars.